Hm, the video’s joke introduction doesn’t work quite as well if it’s not verbalized, so let’s waste no one’s time and get straight to the review. Kyotouryuu is an ancient and powerful sword technique, passed down through the generations, that paradoxically makes use of no sword, but rather one’s own body… meaning that it’s really more of a martial arts than anything else. Our story begins with the seventh head of the Kyotouryuu technique, the young Shichika Yasuri, exiled to a deserted island since a very young age alongside his frail older sister and their father, the former head, who had sadly perished some years ago. It’s business as usual for those in a life of solitude, when one day Shichika and his sister receive a sudden visitor from the mainland, calling herself Togame and claiming to be a strategist (or “strategian”) working for the shogunate. That transition may have seemed abrupt, but all you really need to know is what you could’ve very easily assumed: before long Shichika and Togame set out into the world, on the hunt for those twelve swords of legend. Coincidentally, twelve swords, twelve episodes. Hm, wonder how they’ll pace that one out. Of course, the Katanagatari characters with the most screentime are that very same Shichika and Togame, their constant interactions forming the basis for this series being what it is. As I just mentioned probably a paragraph or two ago, Katanagatari (or rather, its source material) was written by Nisio Isin, who would be best known as the creator of Monogatari. Now, at the time (this is very much no longer the case but at the time), I hadn’t yet seen anything by the guy, and as I understood it, lots of dialogue was kind of his thing, but no one bothered to tell me it would be such compelling and well-written dialogue. Nearly every conversation, whether it be between the two heroes or their rival opponents, is consistently entertaining and magnetizing. Let’s give you an example. Episode 2, the quest for the swords has only just begun, when Togame starts berating Shichika for his lack of strong personality. He’s lived almost his whole life practically alone, so his emotions and expressions are flat as a board. Therefore, so she says, his victories over enemies will not leave a strong impact, because while he wins in prowess, he loses in “character”. Obviously the solution would be to saddle him with a catchphrase, an idea that the stoic Shichika is less than thrilled about. So they banter and they argue and the whole thing goes on for like ten minutes, I want to say, which sounds awful, but it works and it’s engaging, which is almost baffling. Isin has this way with words that makes you want to just keep listening, even when you’re telling yourself “this is superfluous nonsense”. However, it is difficult for great dialogue to thrive on its own without something more to it, a plot or characters behind the words that you want to see more of, which is a perfect segue to start talking about the characters themselves. The star of the show, in my books, was Shichika. I said earlier that, due to his long isolation, Shichika is not very emotive. He’s had no opportunity in his life to interact with anyone at all besides his sickly sister and late father. In fact, at first, he has great trouble even recognizing faces and identifying people he’s already met before, simply because that’s something he’s never had to do. He has little concept of autonomy, claiming from the beginning that he is but a sword for Togame to use as she wishes. Likewise, he also has no moral compass, and won’t hesitate to kill any opponent that crosses his path (a mindset which Togame tries to wean him off of). So to recap, we’ve got a stone-faced killer, with no moral or emotional dilemmas, someone who feels they are but a tool for someone else. I don’t know about you, but that sounds like a boring character… if that’s what he was the whole time. He’s not. Over the course of Katanagatari and his adventures with Togame, Shichika noticeably grows as a person. He sees the world, he learns social convention, he learns how to display emotion, he learns how to love, and he learns the value of other people. Initially, this growth is gradual and subtle, but very much present. At a point, they do kind of get very direct and in your face about it, like “man, look how different he has become”, but that doesn’t change the fact that he does grow and it is captivating. Speaking of captivating, I’ve only talked about Shichika as an individual, but his blossoming relationship with Togame is just as important to the show. Ironically, despite how important it is… I don’t have much to say specifically. It was a good, believable, and (as I’d come to expect) well-written romance as these two young people learned to love each other. An interesting point to note here is that Katanagatari was released as twelve hour-long episodes over the span of an entire year, one per month from January to December, and the in-show timeline more or less follows that, with each episode spaced out in time by a month or so, such that the series as a whole takes places over almost exactly as long as it aired. Aside from this being intrinsically unique as a format of presentation, taking place over such a fairly long period of time, as compared to perhaps other series that are over only, say, a couple weeks, to me made the evolution of the characters much more believable. Ok, but let’s move on to talk about someone that isn’t Shichika or Togame: the villains. Actually, I take that back, not “villains”, the connotation is too hostile. Let’s say “opponents”. Since every Katanagatari episode deals with a new sword, every episode also brings with it a new opponent. Now the reason I refuse to label them as “villains” is because everyone’s so damn sympathetic. Even the most outright “evil” enemies typically have a relatable motivation behind their actions, like vengeance for the death of their comrades or long-term spoilery goals. In one episode in particular, I almost found myself rooting for the “bad guys” more than the good guys. I half-wanted to see them actually succeed. It just so happens that those “bad guys” were the Maniwa Ninja Corps, or “Maniwani”, the group of ninjas that Togame first hired and was later betrayed by. Let’s get this out of the way: they’re furries. Each of them is dressed up in some ridiculous animal suit (the little penguin’s oh-so-adorable). While the actual sword-holders come and go from episode to episode, the Maniwani are a constant presence. You could think of them as opposites to Togame and Shichika, another group that is also racing to obtain the swords for their own reasons. To be perfectly honest, at the outset, I did not much like the Maniwani. They just seemed kind of stupid, without much point or purpose to them, plus their outlandish outfits clashing with the rest of the show. Before long though, I learned to enjoy what they brought to the table, partially due to the aforementioned thing about there being no real “villains”, but partially due to a different reason. That being, Katanagatari is not a 24/7 festival of grim and seriousness. I won’t lie, there are some very serious and rather dark moments, but it also embraces some levity, a level of tongue-in-cheek comedy and ridiculousness. The Maniwani are one such example of that. They’re ninja dressed as things like bees and butterflies. If that’s not “embracing ridiculousness” I don’t know what is, and once I came to realize that semi-comedic aspect of their character, I had a much better time with them. A similar thing is the fact that not all twelve of the ancient swords are actual swords. In fact, many of them are not, in increasingly absurd fashion, from a suit of armor to a robot to a scabbard, which is literally the exact opposite of a sword. It almost goes without saying that the rest of the comedy lies in the already repeatedly-praised dialogue and conversation. Whether it be a clever pun or witty punchline, Katanagatari managed to actually make me laugh out loud on more than a few occasions, which is great to hear considering how hit-or-miss anime comedy can get. Up to this point, I’ve painted a usual episode of Katanagatari as being Shichika and Togame facing off against new opponents in new settings for a new sword with great dialogue, solid comedy and moments of very real drama sprinkled about. Sounds great! But then, the ending. Oh man, the ending. The final couple hours or so of Katanagatari have twists and other plot happenings that, well, I don’t want to touch on and spoil the experience, but if you’d asked me halfway or even three-quarters of the way through how things would end up, I doubt I would’ve predicted exactly this. For that reason and other specifics in the final episode, there may be some out there that did not like this ending, and I can understand. I disagree, but I understand. Suffice it to say that, while I’m not sure I enjoyed how things ended up, I can appreciate them. After how long you’ve been subjected to my ramblings thus far, I would hope you’ve spent at least a little time soaking some of the pretty pictures thrown around. Some anime have a fairly generic visual style but will just blow you away with sheer animation or effects, a la One Punch Man or Fate/stay night. Katanagatari is almost the polar opposite. Much of the show is stylized to be artistically interesting, from the environments to the distinctive eye design, but is often unremarkable from a sheer technical perspective. Notice I said “unremarkable”, not “bad”. I wouldn’t call Katanagatari poorly animated (not even close), but when I sift through my memories, it’s a simple case of the appearance itself being much more memorable than any of the actual movements or execution, especially because a good chunk of screentime is just talking. They even play around with the standard style to an extent, Episode 7 for example sporting much darker lines. There’s no real reason for it, but it just looks cool. Likewise, both openings, but especially the second, are feasts for the eyes, with just a metric crapton of striking layers and colors thrown at you from every direction. Which is as good a time as any to say a brief word on the music: fine. That’s the word, it was fine. It was never intrusive or jarring, fitting the scene or the moment well enough, but there wasn’t a single track (with the exception of the openings and a few ending themes) that I’d feel inclined to listen to outside of the show itself, which seems to be a pretty common occurrence with me and Iwasaki soundtracks. Chalk it up to personal taste, I guess. If you just stumbled upon this series in isolation (which isn’t all that likely, but if you did), you might think that Katanagatari’s premise has the makings of a good action show. Twelve all-powerful swords, a myriad of opponents, and a young strategist plus her martial artist companion out to get them all...but if you’ve been at all listening to anything I’ve said, you know that that is not the case. In fact, most of the time I wouldn’t call Katanagatari an action show at all. Like, there is action, and it’s usually decent action (especially the fight with Sabi Hakuhei. Really, that was something else), but it’s rarely prolonged or plentiful. Rather, I’d call it a dialogue show. But that’s good right? I mean, I spent however many words going on about how engaging and compelling all that chatter was, right? Right, but there is such thing as too much of a good thing. There is a point where the show’s slanted focus towards words over fists wears thin. It’s building up to the big fight of the episode, you can feel it, you’re right on the cusp of a great confrontation, and then Katanagatari will say “Oh, w-wait, you want them to fight? Nah, they’ll talk for ten minutes, then they’ll fight (and probably talk some more between blows).” So to get the most out of this, you have to know what you’re getting into. I once saw someone, somewhere in the depths of the Internet, complain that most episodes (thanks to the abundance of talk and more talk) by no means needed to be double-length, and I can honestly see where he’s coming from. On paper, the actual plot events that make up each hour could fairly easily fit into a time frame half-as-long. For the most part, I’d argue that cutting it down like that would rob us of the banter and character interactions that make Katanagatari what it is… but I’m just going to be blunt. Yes, sometimes it was a little too much. And let’s wrap this up with a small personal quirk. I liked Togame as a character, for her arc, her backstory and her role in the scheme of things, but I was more middling on her personality. She’s this tsundere-ish person who, despite not being all that forthcoming with her feelings for Shichika, of course gets exaggeratedly upset and jealous of him for interacting with other women, which is sometimes played for laughs and sometimes played for actual romantic tension. These mannerisms come to a peak around Episode 9 (which by no coincidence is, in my opinion, the worst of the entire series). Not much else to say on this point, it’s completely a matter of individual taste, and a minor thing arising from me just not caring for that kind of characterization whenever it came up. So, to summarize Katanagatari, great characters (on both sides of the conflict), great dialogue (if maybe too much of it), great visual style, and even a great sense of humor (but just to be absolutely clear, “a great sense of humor” is not me saying that this is a comedy. Because it’s not.) In one draft of this piece, I had a few more segments in “The Bad”, but ultimately felt like I was trying to trump up issues and complaints where none really existed, just for the sake of masquerading as a more “balanced” review or to justify whatever preconceived rating I had in my head. I quickly realized that that’s a terrible way to write, and that it’s obviously best being true to my own thoughts no matter what they be. Also, there’s this whole neat sublevel to the show about parallels to history and ancient stories that (while certainly interesting) didn’t really impact my opinion one way or the other. It’s not vital knowledge to enjoy Katanagatari, it’s just nice tidbits. 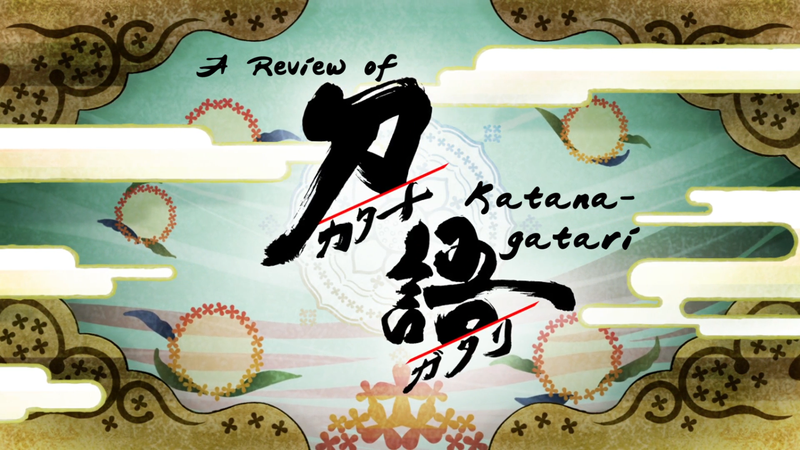 So, after taking everything into account (as well as my own subjective enjoyment), on a scale from F to S… considering how frankly inconsequential any complaints I could muster were, I would feel like I’m doing a disservice in awarding Katanagatari anything less than an S rating. If I wasn’t as tolerant of long-winded talk or as satisfied with the eventual conclusion (which could very well describe you), that’d probably be bumped down to an A, but seeing as I am not that, I have no compelling reason to do so. Which leaves me to be the unfortunate bearer of bad news for this last bit: bafflingly enough, considering just how good it is, Katanagatari is not currently available for legal streaming from any destination. Not a one. So, if you want to watch it… well, you’re on your own for that. For a second opinion, you can always check out Morie’s AniTAY review.